Post No.1228; Dated 12h August 2014. A shocking news item appeared in London newspapers under the title WOMEN AND CHILDREN BURIED ALIVE, Islamic extremists place 500 devil worshippers in mass graves in Iraq. (Please see Metro, Page 1 dated 11th August 2014). It was about burying 300 women and 200 children of Yazidi tribe who refused to convert to Islam. The news was reported by Mohamed Shia al-Sudani, a minister for the Iraqi government. This article is not written to condemn or criticize the ISIS extremists. This is about the Yazidi Tribe. The news papers have described who they were and what they believe in. Most of their customs and beliefs are from Hinduism!!! 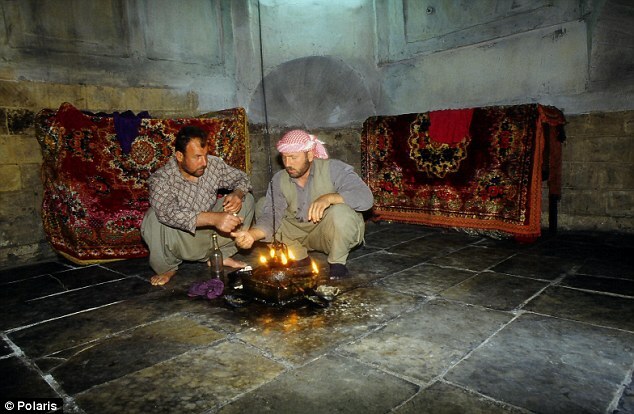 Yazidis burn oil lamps for one the saints. Kanchi Paramacharya (1894-1994) in his talk pointed out that lot of Hindu customs around the world from Shiva dance of Australian aborigines to Sanskrit Inscription in Turkey dated 1400 BCE with ht names of Vedic Gods are Hindu relics. He cautioned us with the following words: Don’t say that Hindus went there and spread their religion. It was the Hindu religion that existed in every part of the world. That is why this religion is called Sanatan Dharma. What you see is only the vestiges of Hindu religion”. Yazidis are part of an ancient religion. From 11th century they organised themselves as a religious group. But they are a pre Islamic community. They are 4000 year old community. They have beliefs borrowed from multi traditions including Zoroastrianism, ancient Iranian religion (Vedic Hindu!! ), Christianity and Islam. They speak Kurdish. There are 700,000 Yazidis in the world and most of them live in Northern Iraq. Their heartland is the north western city of Sinjar ( Now they are driven out by the ISIS extremists). 1.The Yazidis believe in One Supreme Being: Rig Veda says “Ekam Sat Vipra: Bahuda Vadanti “, meaning Truth is one, sages call it by different names. 2.Yazidis say, “Supreme being Yasdan created the earth with the help of Seven Angels”: Hindus say that Brahma created the world with Seven Rishis (Sapta Rsis) who were the forefathers of human race. As a Brahmin I do worship Saptarisis every day in the ‘thrice a day Sandhya Vandhana’ (Tri Kla Sandhya Vandhana) ritual. I recite the mantra with the names of sevensages: Atri, Brhu, Kutsa, Vasishta, Gautham, Kasyapa and Angirasa. The word Yasdan may be the corrupted form of Yadunandan (Yadava Krishna) or lot of Hindu names beginning with Yagna or Yajna. In the Vedas we find names like Yajna Vacas, Yajna Sena, Yahna Valkya, Yajnesu and many more. 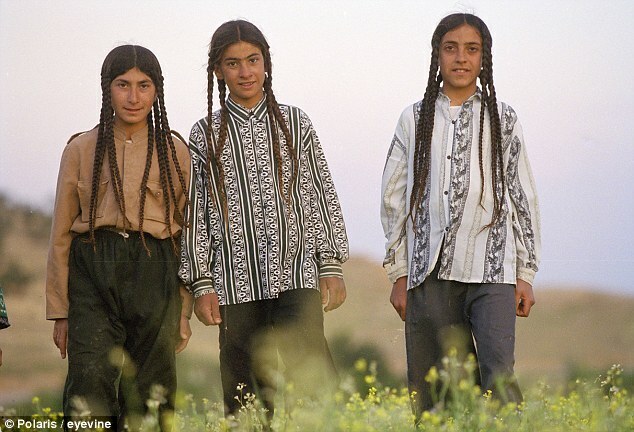 Yazidi boys plait hair like girls. 3. Most important of their gods is Peacock Angel. 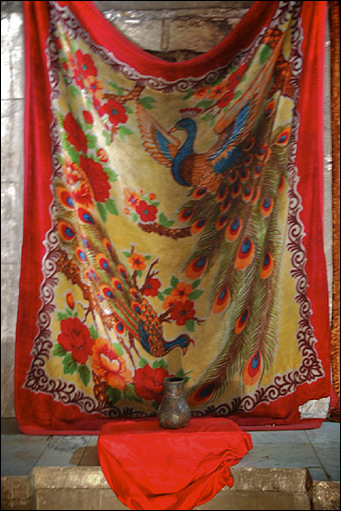 Hindus worship Kartikeya who rides on a Peacock. His names like Mayura Vahana, Mayil Vahana, Siki Vahana and several other names are associated with the Indian national Bird peacock. It is primarily an Indian bird exported to West Asia from Biblical days. 4.Yazidis believe in reincarnation: No Semitic religion believes in reincarnation. Only Hindus and its offshoots like Buddhism, Jainism and Sikhism believe in Reincarnation. This shows very clearly that Yazidis are Hindus. 5.Peacock angel is known as Malak Tawous. It may be the corrupted form of Palak= Bala Deva or Palaka Deva. P < M<V are interchangeable is well known to linguists. 6.They worship five times a day; they do circumcision: This is the local custom followed by ancient people in that region which is taken by other Semitic religions. Circumcision is not followed by the Hindus. 7. Malak Tawoo means “devil” in Arabic. All idol worshippers were called as Devil worshippers by Semitic religions. This is another proof to believe that they are Hindus. 8. Yazidi means Worshippers of God. They are fire worshippers like the Vedic Hindus and Iranians. They keep oil lamps burning at their homes for saints. This like Brahmins Three Fire worship at home (Three Fires: Dakshinagniyam, Gargapatyam and Ahavaniyam). Ized means God in Persian. Yazdis derived from this word, they believe. Ized arrived from Jyothi (Light/Fire), I believe. 9. Why they were buried alive? Metro Newspaper published from London added this on page 5: “Unlike Christians, who have been given the choice of paying a tax to the Islamic organisation – known as Jizya — the Yazdis have been given a stark choice: Convert to Islam or be murdered”. The news is reported by the BBC, Reuters, Daily Mail and several other mass media in addition to Metro news paper quoted above. One can find more information about Yazdis by googling. Pictures are taken from newspapers; thanks. for more:https://www.youtube.com/watch?v=cX-g587ral0 tamil is unique and similarity in many places..